It restricts the stock of medicines that Pharmacy must hold; there would not be enough space for a hospital Pharmacy to stock every single medicine that is marketed. Since Pharmacy can’t stock everything, then healthcare professionals are encouraged to choose the most appropriate medicines to have available for their patients. When choosing medicines for the formulary, they consider effectiveness, safety, patient convenience, and value for money. If prescribers have a limited range of medicines to choose from, they become more familiar with them and this reduces the risk of errors. Reduced waste: if a Pharmacy kept a very wide range of medicines, then many would not get used, go out of date, and have to be thrown away. Instead of stocking small amounts of, say, ten similar medicines a hospital might routinely keep just two. Because these two medicines will be used more, it increases Pharmacy’s ability to negotiate a discount when purchasing. A formulary makes it clear to everyone that all the medicines approved by NICE are available for local patients. There are further advantages if your Trust has a joint formulary with primary care because local GPs are encouraged to use the same medicines as their colleagues in hospital, and vice versa. This means that the hospital should automatically have these medicines available if a patient is admitted to hospital. Formularies quite often have a Red-Amber-Green or ‘RAG’ rating system for alerting prescribers to a medicine’s status on a formulary. For example, a red drug might be confined to consultant prescribing only; an amber drug might only be initiated by specialists; and a green drug might be prescribable by anyone. There are many variations on this theme in terms of the colours used, and what they mean. Although we have concentrated on the list of medicines that a formulary contains, many formularies have other content as well. Some will advise about the preferred first choice medicine for a condition, or specify who can prescribe certain medicines. Your formulary may also have detailed guidance on treating a range of conditions, or advise on drug administration. If you’d like to see a detailed formulary that is more than just a list of medicines, then look at the Evelina London Paediatric Formulary. NICE have produced guidelines on developing and updating local formularies. These say that all organisations should publish their formulary online and all other information relevant to it, so most hospitals publish their formulary on the Trust's website but some may print a paper copy too. Find out where your hospital’s formulary is published, and become familiar with the way it is organised. Is it a joint formulary with primary care? Do you have a RAG rating system and what do the different colours mean? How does a medicine get on to the formulary in your Trust? 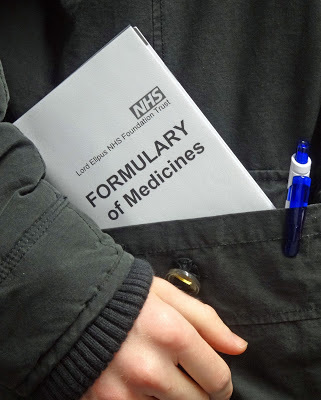 Can any pharmacist authorise the supply of a non-formulary medicine for a patient? How is this done in your hospital?